I’d say that this was an impromptu purchase, but actually I had done quite a bit of research on travel cots so it was more of an emergency purchase than anything else. 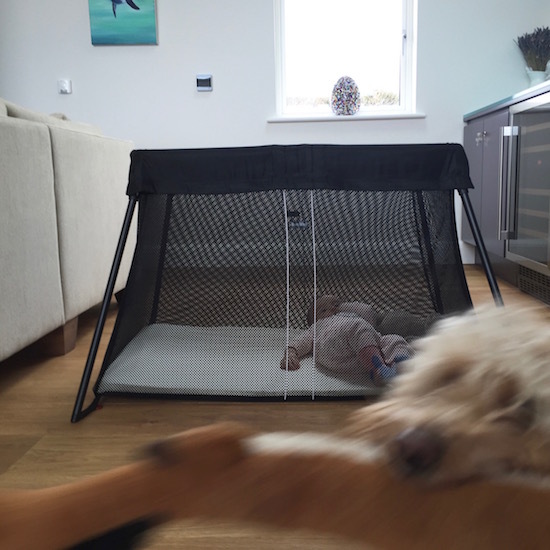 I ordered the BabyBjorn Travel Cot the night before we were due to leave on a little trip to Cornwall and it arrived – fortunately, bless you Amazon Prime! – two hours before we set off. I’ve tried quite a few travel cots – various hotels, friends’ houses, one that my sister has left behind and one that we sort of inherited – but what I really wanted was a lightweight version that wouldn’t take up space in the boot and was easy to put up and take down again. Nearly every travel cot we had tried was either fiddly to construct or bulky to store or weighed an absolute tonne; some had the crappiest, hardest mattresses, others had nothing that could even be identified as a mattress. Meaning that an extra mattress was necessary, which isn’t ideal when car boot space is at a premium. I took the plunge with the BabyBjorn because I loved their bouncer and high chair (review upcoming) so much; both incredibly well-designed and compact and – well – cool looking. No garish colours or Mickey Mouse embellishments, just stylish shades and modern lines. 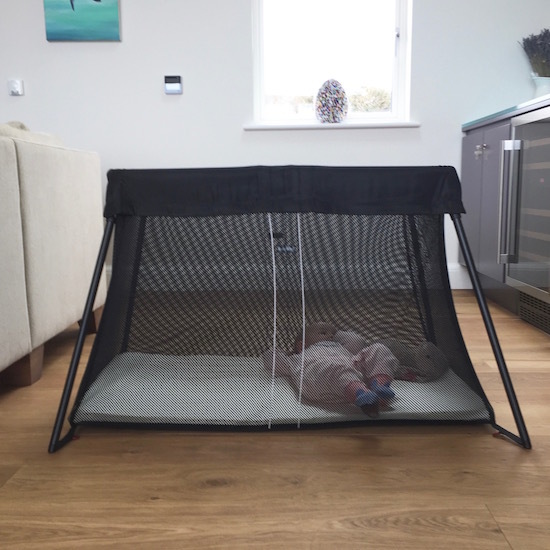 The travel cot had excellent reviews – the other lightweight one I had looked at, from a brand called Phil and Ted, was slightly cheaper (and weighed a lot less) but the reviews were mixed. So I took the rather expensive plunge (£169.99) and crossed my fingers that I’d made the right choice. 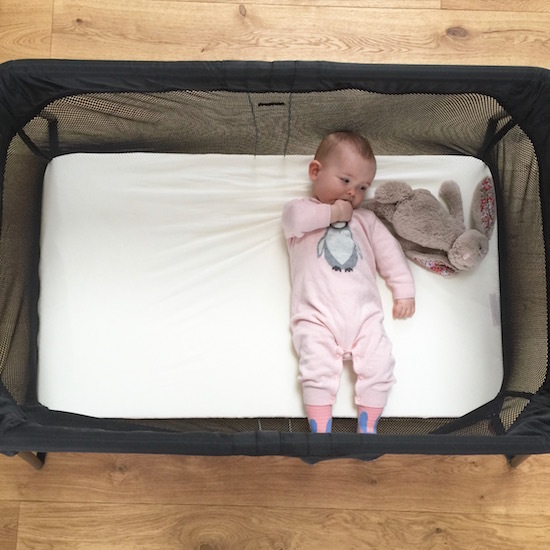 The BabyBjorn travel cot was instantly impressive – the whole bag was so light in comparison to other travel cots I’d tried that I thought that maybe something had been left out. But no, it was all there, and it took about twenty seconds to get the cot frame out of the bag and set it up. Twenty seconds! My husband can do it even faster, now he’s au fait with it – it’s as easy as pulling the sunshade over the top of the pram. Almost. Despite the cot being so light (it’s a total of around five and a half kilos) it feels very sturdy. Probably because the bottom surface area is loads larger than the top. Everything feels very well made and hopefully it will last well; we’ve also used it as a pop-up play pen because it’s so easy to put up and down. I bought a heavy metal play pen on Amazon a month or so ago and it is in the corner of the living room acting as a sort of toy corral because neither of us can ever muster up the energy to move it to where it needs to be! The mattress that comes with the BabyBjorn seems pretty comfy and decent, despite it being on the thin side. One great thing to note, for those who like to use a motion sensor pad when their baby is sleeping, the BabyBjorn does work with the Angelcare one (but please test for yourself before relying on it!) and you don’t have to add a board or anything underneath. I think it’s because the mattress and the mesh that supports it actually rest flat on the floor when a baby is on top. For me, this was a huge bonus because I haven’t yet found a travel cot that would work with one! I can’t find anything to fault, really, which you’d expect when you’re paying top money for a travel cot, but it’s worth mentioning that you really have to lean down to put in and pick up the baby, so it’s perhaps not suitable for a very new baby if you can’t bend for medical reasons. Mind you, most travel cots are quite low down – I think there are ones with an insert for a newborn that raises them up to a higher level, but they’re not as lightweight and travel-friendly as the BabyBjorn. Size-wise, it’s slightly odd – I bought a special fitted sheet for the mattress as some of the reviews noted that standard ones didn’t fit. It was ridiculously pricey – ridiculously – and that did annoy me somewhat, as the cot wasn’t cheap in the first place, but it was pleasing to have a sheet that fit smoothly and neatly. No other cons here, other than the price, but this is definitely – definitely – a case of “getting what you pay for”. The quality and design are superb – I’ll update this post in a year or so when it’s taken a proper battering! If you’re wondering whether you can use a Sleepyhead with it: it’s a “yes” for the small one but a “no” for the Grand. BabyBjorn Travel Cot is £169.99 at Amazon here.